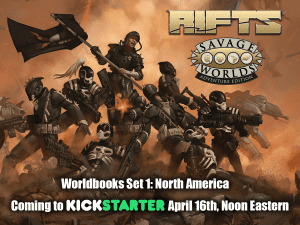 Rifts® for Savage Worlds Worldbooks Set 1 Kickstarter Launches April 16th! 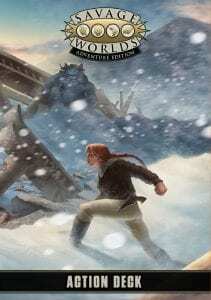 In 2016, Pinnacle Kickstarted Palladium Books’ popular setting of Rifts® using the award-winning Savage Worlds system. 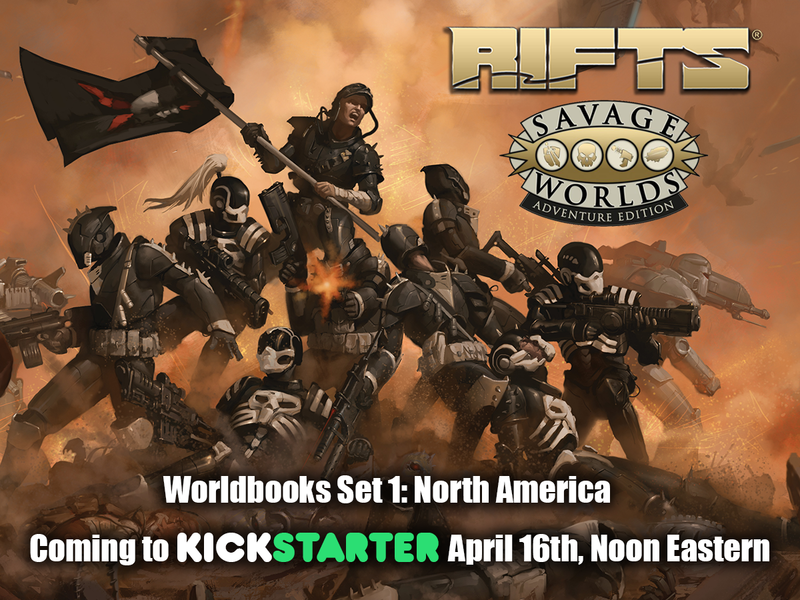 We’ll announce more details soon about special deals for previous Rifts® for Savage Worlds Kickstarter backers. For now though, make plans to be there for the launch on April 16th! For fans of Rifts® and Savage Rifts®, The Rifts® Bestiary Megaverse® Insider Opportunities for Rifts® Bestiary Volume One gives you the chance to get your hands on some exclusive items and bundles, but do it fast because this offer ends April 8th, and some bundles are limited to a dozen or just one! With offers ranging from $5 up to $1,400, you can get your name and/or character listed in the upcoming Rifts® Bestiary™ Volume One, get signed, limited hardcover editions, original artwork by Kevin Siembieda and Charles Walton II, and much more. 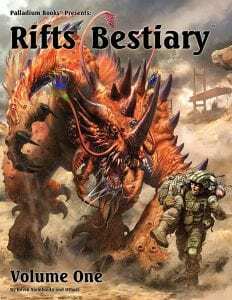 The Rifts® Bestiary™ Volume One is the first big “Monster Book” reference ever done for Rifts®. Rifts® Bestiary™ Volume One collects nearly 100 animals, and offers more than a dozen new beasts found across North America. Presented in alphabetical order with the first third or half appearing in the 224-256 page Volume One, and the rest appearing in Volume Two. Actually, they may need a Volume Three because there are so many monsters and exotic animals in Rifts® North America alone! Each is highly detailed and expanded, offering adventure ideas, and accompanied with a map that shows where they can be encountered at a glance. Most of these items will never be offered again, so this is your only chance to get many of them. Visit the Megaverse® Insider page for complete details, and become a Megaverse® Insider today! The books are open and it’s time to get made! The Kickstarter for Wiseguys: The Guide to Organized Crime for the Savage Worlds Adventure Edition (SWADE) is now live! 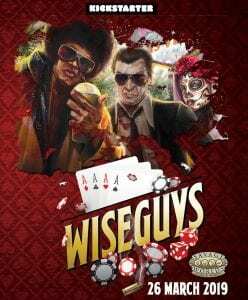 From Savage Worlds “Ace” licensee Just Insert Imagination, Wiseguys: The Guide to Organized Crime is a crime setting inspired by the movie Casino by Martin Scorsese, and crime fiction movies by Quentin Tarantino of the 90s such as Reservoir Dogs. It includes new character options, setting rules, and a robust bestiary that can be used to run campaigns featuring organized crime protagonists or antagonists. You can learn more about Wiseguys by downloading the FREE JumpStart, here. It contains a primer, new character options, a Mob Tale, and pregenerated characters. Visit the Wiseguys Kickstarter page today to pledge your support. They’re going to make you an offer you can’t refuse! You’ve heard of Savage Saturday Nights, right? Well how about a Savage Seven-Day Sea Cruise! 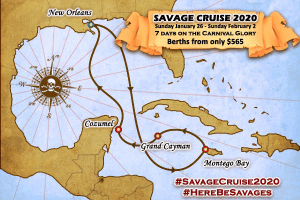 In 2020, Savages are taking to the high seas on the Carnival Glory for a seven-day Savage Worlds, Board Gaming, and Adventure cruise in the Western Caribbean hosted by the Rocky Mountain Savages. Starting in New Orleans on Sunday January 27th, passengers will enjoy three days of gaming at sea along with all the other activities and amenities of the cruise. The next three days will feature on-shore fun in Montego Bay Jamaica, Grand Cayman, and Cozumel Mexico with dinner and gaming in the evenings on board. Saturday will be another gaming at sea day for the return trip to New Orleans. Interior berths start at $565 and include accommodations, shipboard meals and entertainment, a private game room, hosted cocktail party, a $50 shipboard credit, prizes, and a few surprises! For a limited time, just $25 reserves your space, and all deposits (payment plans available) are fully refundable until October. For more info and to make your reservation, visit the Savage Cruise 2020 website. And be sure to follow the Savage Cruise Facebook page, as well! The Monsters Have Arrived for SWAG Participants! The SWAG Art Monsters assortment contains PSD and PNG files of a variety of beasties ranging from alligators to zombies. We look forward to seeing all these creepy crawlies popping up in future Savage Worlds Adventurer’s Guild products! 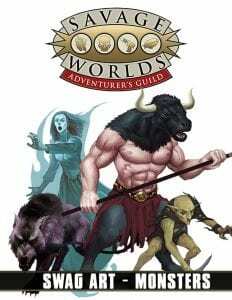 The Savage Worlds Adventurer’s Guild (SWAG) program now has more than 30 titles ranging from Ace licensee setting JumpStarts to alternate fan-created rules to foes and adventures galore! If you haven’t stopped by to see what’s new, check it out today! * This artwork is intended only for use within Savage Worlds Adventurer’s Guild products. It may not be resold individually or in groups otherwise. 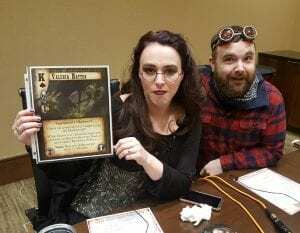 A few weeks ago, the cast of WildCards, Saving Throw Show’s Savage Worlds livestream, donned their best Western wear and joined Christine and David Lapp of Pinebox Entertainment for the first part of a special Deadlands trilogy at GenghisCon in Aurora, Colorado. 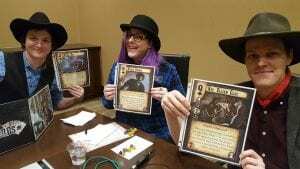 Players participating in Doomtown round-ups at the convention were able to influence the continuation of this story which will lead to Part II to take place at ChupacabraCon VI in May. Players at that convention will, in turn, get to influence the next act with the final session taking place in Tombstone, Arizona, for this year’s Doomtown Destination Round-Up in October! You can watch the first session in its entirety right here! To see which Doomtown cards were referenced in the story, check out the complete list of spoilers thus far presented from the next Doomtown expansion, Out For Blood. And to join in on the post GenghisCon discussion and see the decklists from the events, head over to the Pine Box forum. 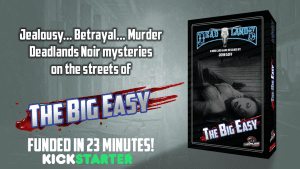 Thanks to the combined efforts of you and 607 other backers, The Big Easy: A Deadlands Noir Card Game, will soon be a reality! While the campaign came up just two backers short of the final goal, Last Lion Games is still going to unlock it and add the last three Equip cards into the set. They certainly couldn’t let two pledges come between a gumshoe and her Matter Disrupter! 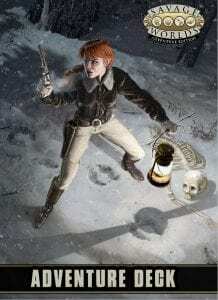 After the excitement of the past few weeks, the folks at Last Lion Games will be taking a little time to refocus, and then they’ll send backers at Gumshoe level (and above) links via DriveThruRPG.com for a complimentary download of a print-and-play version of the game. After that, they’ll get the PledgeManager up and running and we’ll be sure to post an update then to let you know how to complete the process so you can pay for shipping and get your mitts on the physical game. Until then, watch your back, shamus, you never know what’s around the next corner in… The Big Easy. For those new to Savage Worlds, combat initiative in the game is managed with a standard deck of 54 cards (the Jokers mean extra fun). 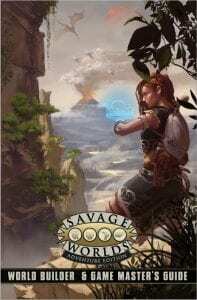 Right now, for just $3.99, you can own the PDF version of our all-new, over-sized (and the PDF has a poker-sized option) Savage Worlds Action Deck featuring fantastic art by the incomparable Hugo Award winning Cheyenne Wright! And if you want to get your hands on the professionally printed deck, hop into our PledgeManager today and preorder it (along with a number of other Savage Worlds Adventure Edition essentials and accessories)! This gives you the best rate for shipping (especially for non-United States locations) and you will receive your copy before retail release. After completing your order for a physical copy there, email site.admin@peginc.com for a complimentary copy of the PDF! Just remember, you have until April 3rd to lock in those preorders. Geek & Sundry and Bleeding Cool Love SWADE! We love reading reviews of our products, especially the detailed ones that really get down to brass tacks about each item. While there’s certainly no substitute for playing (or running) our games, you can learn a lot from a solid review and that’s why we’re always happy to share them! First up, Rob Wieland of Geek & Sundry presents Five Great Changes in the New Edition of Savage Worlds RPG. 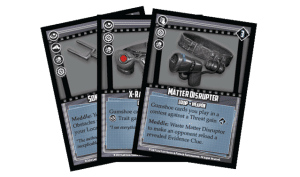 In this article, Rob discusses some of his favorite updates in Savage Worlds Adventure Edition including Core Skills, the new way Advances are handled, additional narrative options, and all the new Game Master advice peppered throughout the volume. 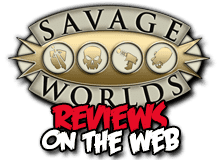 Over at Bleeding Cool, Leigh Kade looks under the hood and kicks all the tires in his review titled Endless Hours of Fun with Savage Worlds: Adventure Edition. 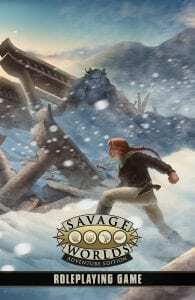 If you’re new to Savage Worlds, this article not only examines a number of updates to the system, it also goes over the basics and presents a little history of the game going back to the first printing!